Okay...I promise I'm done for awhile. 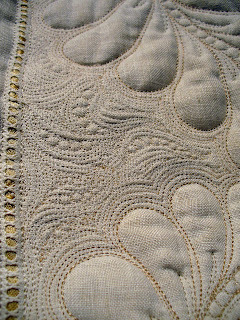 I'll be leaving for Wichita, Kansas early tomorrow morning to teach/speak for the Prairie Quilt Guild. I wanted to get enough done on this piece so I could bring it along with me for teaching purposes. This dresser scarf is very wiggly and it's almost like quilting on Jello sometimes. I often tell my students when they are quilting on a "creatively pieced" quilt it's important to choose designs that are NOT straight and even...that only highlights the "creativity". Same goes for Jello-wiggly linens. I chose to use my "Pearls and Swirls" background around the feathers as it provides beautiful movement and was a great way to pack down the extra puff and fabric around the feathers. Also hides Jello wiggles. I was in a dilemma about the straight open areas on the outside edge of the scarf...major Jello. I love the repetitive lines so chose a 1/2" repetitive line grid...resembles a beautiful basket weave. I made absolutely sure my repetitive lines were NOT even...that adds texture. I then went back and restitched my main grid lines to hide botched up traveling between squares and it added just one more texture/dimension. 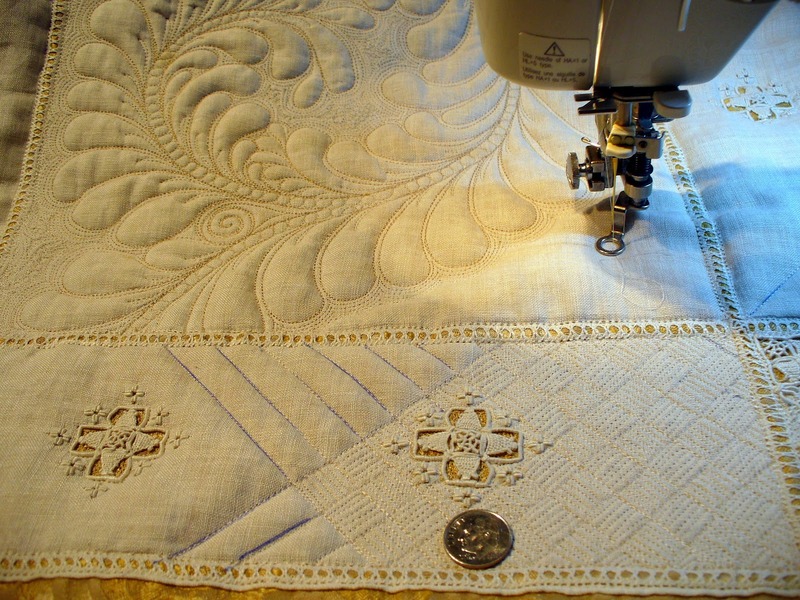 Superior Threads' Kimono Silk is being used for all of the quilting. L.O.V.E. that thread! You are such an inspiration! I absolutely love everything about this! 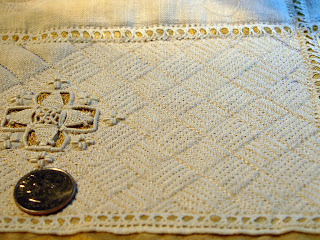 And I've been scouring the antique shops and thrift stores for vintage linens, have found a few, and am ready to give it a go! The really cheapy ones I've found for $1 will be my practice pieces. And then I'll move on to the nice family pieces I have been hoarding! No one else in my family cares about linens, so I got them all!! Yippee! My oh my oh my. First of all thanks for the dime for sizing! You sure have good vision to make things so small. And I love your idea of going over something twice to hide wobbles. This piece will be absolutely gorgeous when it's finished. But then what of your's isn't stunning? 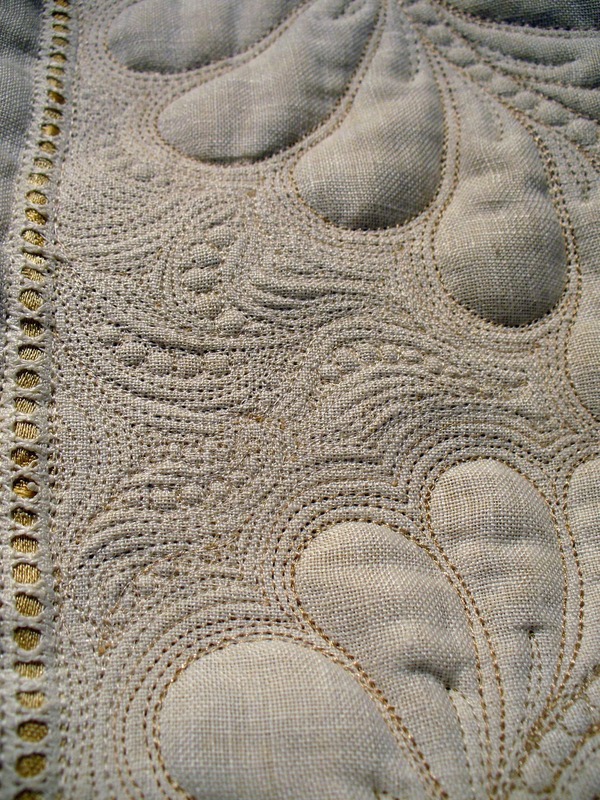 Appreciate the quilting details on the dresser scarf stitching. 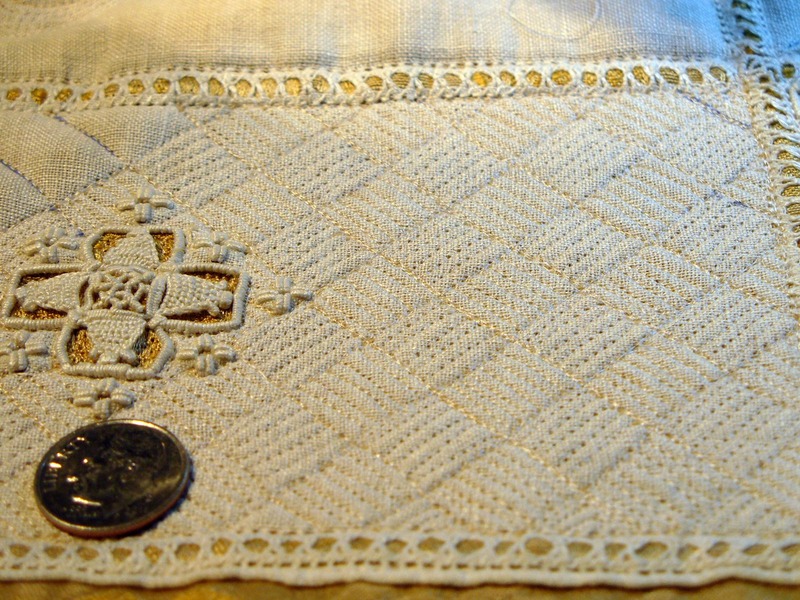 Many of the pieces I have qualify as "textile Jello", also!! Thanks for the stitching tips! I am sure your class will go well! I love your pearls and swirls background fill. I am so looking forward to your classes at AMQF in September!